I came across a drool worthy picture on Pinterest of these delicious looking loaves of crusty bread filled with eggs, cheese, bacon and sausage. 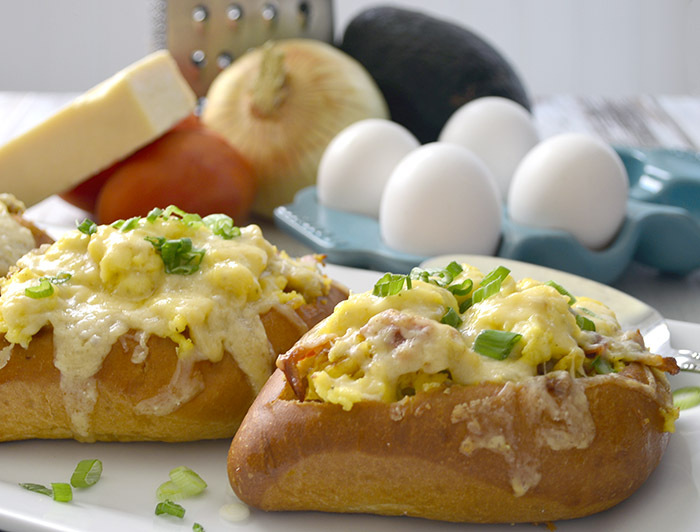 I knew I had to make Baked Egg Boats and what better time to do it than during Brunchweek! The Baked Egg Boats I saw on Pinterest were made with whole loaves of crusty french bread. If I were feeding a crowd I would totally go that route but since its just me and Mr.Pinkcakeplate I made a single serve option. These Baked Egg Boats are packed with creamy eggs, crispy bacon, spicy sausage and melty Cabot Cheese! I also put delicious Vidalia Onions in the egg mixture. I pre cooked my egg mixture just a bit so the bread would not get totally soaked but you can skip this step if you would like and add the egg mixture directly to the bread just bake a little longer until the egg mixture is completely set. 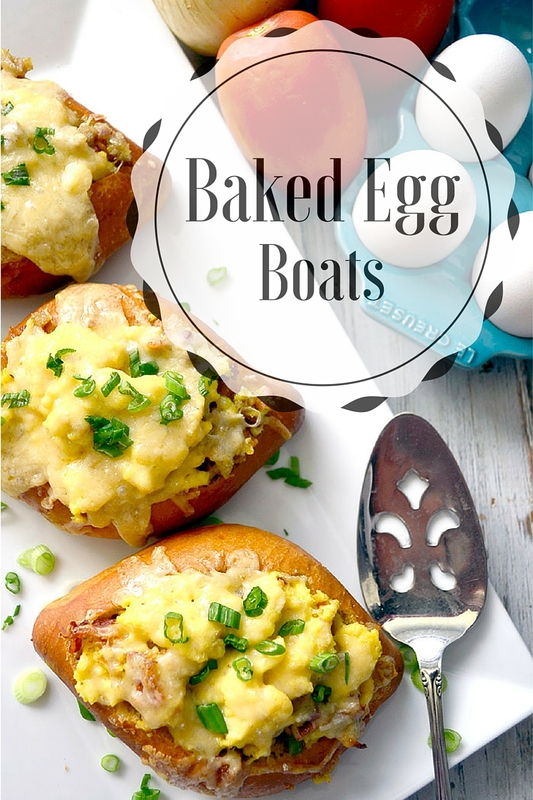 These Baked Egg Boats are easy to make and so so delicious. We had them for dinner with home fries and fresh fruit. If your looking for something different to make for breakfast or in this case brunch I would give this recipe a try. Whisk together the eggs, sour cream, onion, salt, and pepper in a bowl, mixing well. Cook in a hot skillet until just set. Mix in bacon and sausage and half of the cheese. Cut off the top 1/2 inch or so of each leaving a 1/2 – 3/4 inch perimeter around the top, then pull out most of the doughy insides. Place the rolls, hollow side up, on the prepared baking sheet. Divide the egg mixture evenly among the hollowed-out rolls. Top with remaining cheese. Bake for 15-20 minutes, until the filling is set in the center and cheese is melted. Let cool for about 5 minutes before serving. Cut and serve. Looking for more #brunchweek recipes?